This week's Tuesdays with Dorie (TWD) recipe was chosen by April of short + rose: Cherry Fudge Brownie Torte. 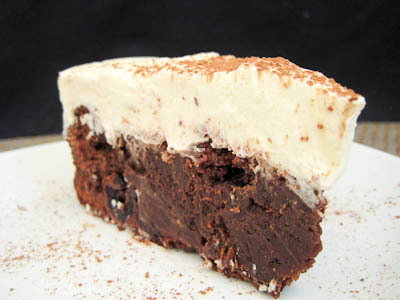 It's a fudgey brownie layer full of chocolate and cherries, topped with a creamy mascarpone mousse. 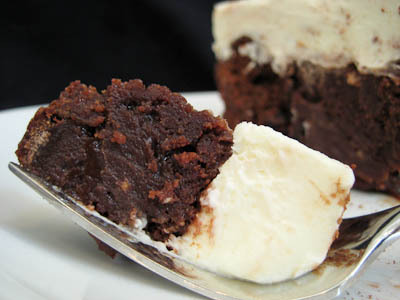 The brownie layer is very rich and dense. It's nicely contrasted with the light and creamy mascarpone mousse. An interesting ingredient in the brownie layer is ground black pepper. It adds a very subtle flavor to this torte but isn't overpowering. I only added one teaspoon of black pepper - I think two teaspoons would probably be too much. The cherries are a wonderful surprise to bite into and keep this dessert from being too basic. 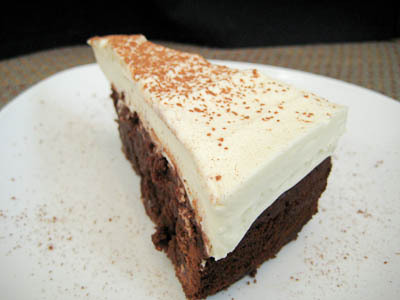 The torte is simple enough to make but yields a very decadent dessert perfect for serving guests. Thanks April, for picking this recipe, I would definitely make it again. If you would like the recipe, you can find it here. 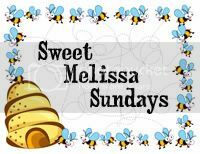 Make sure you check out the TWD Blogroll, to see how everyone else enjoyed this fudgey treat. - I used semisweet chocolate chips instead of chopped chocolate. - I omitted the kirsch due to my little bun in the oven :) I simply boiled the cherries and water until almost all of the water was evaporated, then added the preserves with a splash of water until it seemed a good consistency. I like that your mousse is so firm - makes for a very pretty torte! It looks wonderful! Definitely one I'd like to try. Your torte looks fantastic! Terrific photos. I used choc chips as well...this was a great recipe!! That looks dense and chocolatey and perfect!